Are you feelin’ lucky, my friend? Are you ready to rumble? 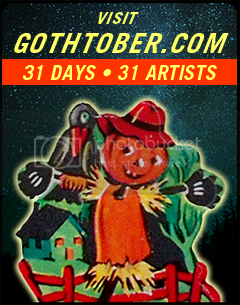 Are you a Gothtober party animal? How many rounds can you go? Well it’s Gothtober DAY 12 so let’s just count out the shots and see where the night takes us. 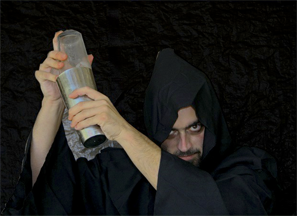 Your horse is headless, your witch is brewed, you are three… four… thirteen ghost sheets to the wind! That is, if you take a romp to the cave of spirits with Del Norte Presents! They are here, they are back, they are pouring themselves and you some cocktails for the witching hour. It’s always been well known that if you imbibe enough beverages, you will either meet or become something other than is expected. You could meet a blue fairy, you could become Elvis, you could wander into a night scape of incomprehensible zombie sing-a-longs! BRAIIINNNNZZZZZZ!!!! We suspect that this might be the MOST fun anyone’s ever had making a Gothtober piece, at least, where revelry is concerned. Watch it, but also watch out, it seems a little haunted, did you see that bartender? I didn’t! It’s a joyous celebration, possibly a wee woozy outcome. It’s nothing a little alka-seltzer, low lighting, aspirin and an ice pack on the head can’t solve in the morning. 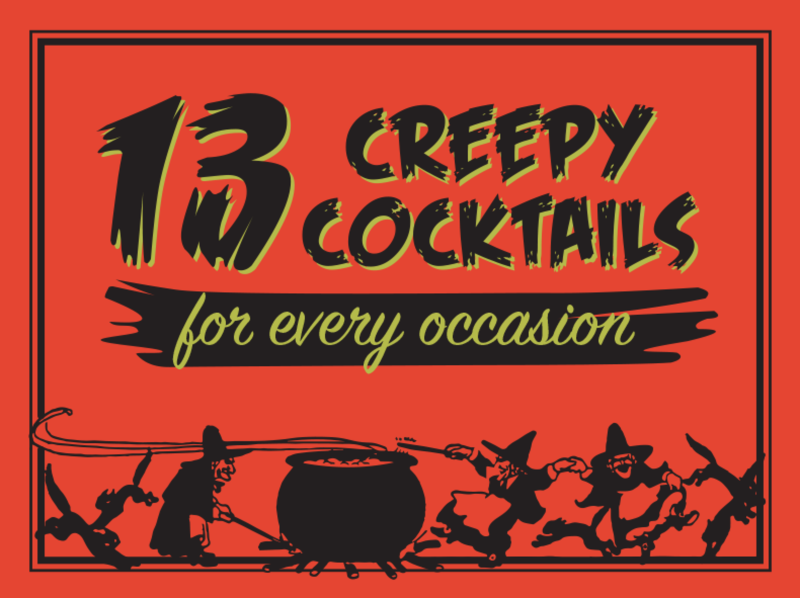 Also: Something kind of spooky… the day before on Gothtober, is Dianne Chadwick’s 13 creepy cocktail recipes for Day 11, and then for Day 12 we have these fearless carousers from Del Norte Presents getting absolutely soused with spirits! These Gothtober artists, to my mind, have never met. They just came up with these shenanigans and it was put together so serendipitously to make a Double Whammy hootch-a-rama on the Gothtober calendar this year, a one two (spiked) punch! Click on Gothtober DAY 11 and receive a delicious and ghastly presentation from Dianne Chadwick, drink vampiress extraordinaire! 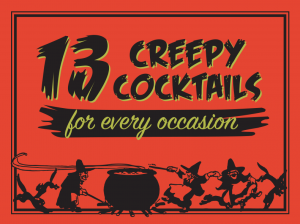 If you’ve been stumped at what to serve at your Halloween cocktail party, fear no more, here we have thirteen wonderful recipes to knock people’s heads off… literally. From the “Corpse Reviver” to the “Bitter Pumpkin” there’s plenty to add to your boiling cauldron this month that will impress all of your ghoulie guests. Nothing builds friendship and good times like wormy ice cubes and plastic spiders. We’re considering trying each and every one of these before October is done, we’re very goal oriented around here. Bewitched FOREVER in 10 Minutes! Treats Comments Off on Bewitched FOREVER in 10 Minutes! Make it a double, Sam, it’s time to sit down and celebrate the 51st anniversary of Bewitched!!! The most drinking-est character is Darrin, followed by Samantha, Larry, Endora, Louise, and then there are a host of other minor characters that take part in cocktail hour. Seems like everyone in 1964 had a cigarette between their fingers and a highball in their hand. Enjoy visiting yesteryear with this marvelous collection of clips, make yourself a strong one, wiggle your nose and press play. 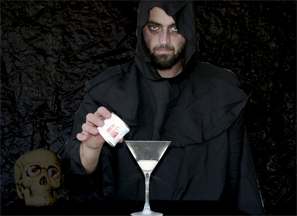 You know it’s October when you’re drinking cocktails involving candycorn-infused vodka. You heard me. And that’s just one of THREE amazing, haunted cocktail recipes offered by restaurateur Ben Ling. 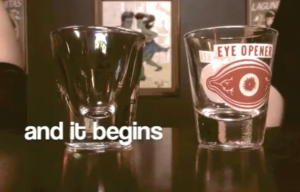 He also provides a handy guide to making an en-GROSS-ing cocktail garnish that very closely resembles an eyeball, but much more delicious. How many recipes do you have that include the instruction, “stuff eyeball into socket”? Hmmm? Well, now you have exactly one. Bottoms up!